I have always loved Unicorns, since I was really little. I used to read like a million books about unicorns a week. I also loved the fact that unicorns were with fairies and other mythical creatures and helped them. Also the fact that Unicorns seem like they are fragile creatures that could die easily and be destroyed like a spec of dust. When really Unicorns could kill you a second with a flick of their horn. They were considered so fierce that they weren't put on the Ark, but instead swam around for the forty days, until there was land. That is not only epic, but totally awesome. Unicorns are real. That statement is probably against everything that a person has been taught, but for thousands of years, unicorns were a fact of daily life. People that had seen a unicorn went on to become legends in history books. They were considered to be scared, holy, and one of a kind. Another interesting fact is that Unicorns are one of the few mythical creatures that were no made out of fear. Still, the mythology of unicorns as we know them today and the past are very different. In order to get a conclusive view, the mythology of unicorns in the ancient times, eastern counties, such as India, Japan, and China, and the Middle Ages all need to be examined separately. 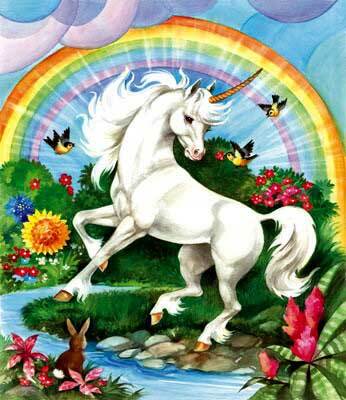 The word Unicorn also appeared in the Bible a total of nine times. Aside from the words in the Bible, there have been stories about unicorns and biblical heroes. Adam and Eve supposedly named the unicorns first and was the only animal to accompany them after their expulsion from Eden. During the Flood, the Unicorn wouldn’t go on the Ark, because it was untamable. Instead the Unicorn swam around for Forty Days and Forty Nights. Julius Caesar and Alexander the Great are probably of the two most well known leaders in ancient times. Both of these leaders supposedly saw unicorns, actually Alexander the Great maintained that he tamed one and later became his war horse, Bucephalus. Bucephalus was described to be a man eating beast with a massive horn and many called him a Karkadann. A Karkadann supposedly shook the Earth that it walked on and that even Elephants would run from it. One of the gates of Babylon had a unicorn guarding the city. Eastern myths of unicorns were similar to the ancient mythology. The Chinese had zhi, which supposedly separated the guilty from the innocent. If someone was guilty, they would stab the guilty in their heart and spare the innocent. A zhi supposedly lived in the courts during the early Han dynasty. Court officials had zhi sewn into their robes and hats. Even today, the symbol of law incorporates the symbol for zhi. Genghis Khan was approached by a unicorn that had his father’s eyes. He didn’t attack India, because of this encounter. The unicorn was also one of the four most fortunate animals. It included the dragon, phoenix, and tortoise. The unicorn was suppose to protect the forest. The Japanese unicorn was a Kirin, which was more like a lion, then a horse. It’s skin was covered in scales and occasionally surrounded by flames or clouds. The Kirin also never ate a living thing, could walk on water, and it’s hooves never bent a single blade of grass. In the early civilization of India used seals of unicorns. The myth of unicorns extended into the Medieval Ages. The unicorn became what we know it as today, a gorgeous horse with an elegant horn. Unicorns also began showing up on many heraldry. Scotland has two unicorns, while the United Kingdom has a Unicorn and Lion on it’s arms. German people have long believed in unicorns and pictures filled the churches and palaces with their images. Unicorns also became a symbol for Christ. The unicorns were also only attracted to virgin girls and were used in order to catch them. Unicorns were also used to determine if a young woman was a virgin, because it could only be tamed by unicorns. Queen Elizabeth kept a unicorn horn in her desk and paid what would be equal to 20 million dollars today. The royal throne of Denmark was supposedly made of unicorn horns. Ceremonial cups were also made of alicorn, because it was suppose to stop poison. Alicorn was also used for a lot of medical purposes, it was believed to stop the plague, seizures, rabies, infections, and other illnesses. Unicorns are still surrounded in mystery, some believe that the legends were based on goats or rhinos, while others think that they went extinct at some point. All myths started for a reason, and they only continue if there is a possibility that they are real. The Lochness Monster and Bigfoot are still being debated if they are possible. Unicorns might be real or could be just a myth, only time will tell. Um, yes plz! Team Unicorn 4eva!!! Sarah, this post puts you on the awesome list. Not that you weren't already on the awesome list, but OMG, this rockssss!